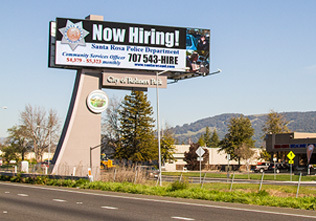 Looking into placing a billboard in Rohnert Park or the surrounding area as part of your next marketing plan? Veale Outdoor Advertising is here to help! With the local digital billboard within sight of the 101 Highway and a variety of other options for billboards throughout Sonoma County, the creative opportunities are endless. Many local and national businesses find great advertising success in this area, and we’re here to guide you on your path toward seeing some of the same success. When it comes to digital, the billboard in Rohnert Park offers a wealth of options for innovation and creativity. It’s the perfect solution for advertisers who require regular changes to their message because they put on multiple sales or events, since the digital copy can be quickly changed. Digital also allows for unique interactive features, such as a live feed of what’s currently playing on your radio station or the current weather. This sort of outdoor advertising can inspire immediate action in consumers by encouraging them to tune in or look for more information. From local theater to national franchises, there are all sorts of ways to catch the eyes of the thousands of commuters who travel through the 101 corridor every day. Unlike other forms of advertising that can typically be avoided with a fast-forward button or by closing a browser window, OOH advertising offers an opportunity to catch consumer attention for a few precious moments, and those moments can make all the difference in your next campaign. To make sure your business gets noticed with a billboard in Rohnert Park or the surrounding area, contact us here at Veale today. With our experience and your creative spirit, we’ll make a winning combination!